LPS Inc. brand game storage boxes feature a tough clear plastic top and black game tray bottom. The interior measures 8 5/8" wide by 11 1/8" high by 3/4" deep (220mm x 283mm x 19mm). 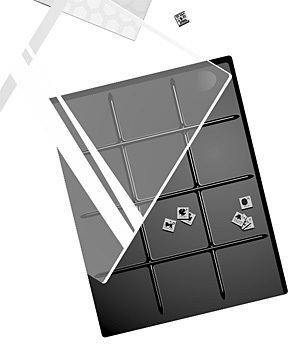 The game tray bottom provides 12 open compartments for sorting counters as before. But, it's made from a heavier gauge of plastic (stiffer) and the compartment ridges now completely run to each side of the box to prevent any game pieces from drifting!